Great timing: Wet snow after a prairie burn! What's good for a prairie? A big wet snow right after a burn! A big wet snow brings down lots of moisture but causes no soil erosion. As the snow melts, the water slowly seeps into the ground. Ideal, this time of year, just before early spring warm-up. We are especially blessed this year because we got almost all of our prairie burns finished just a few days ago. Great timing. Pure luck! 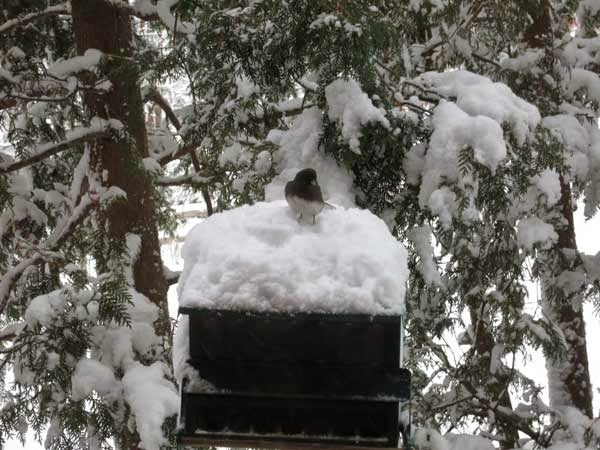 A big wet snow is not too uncommon in southern Wisconsin. Sometimes it's a record snow, such as April 8-9, 1973 (the night my daughter was born), when Madison got 13 inches of very heavy snow. Such late snows are sometimes called the "farmer's friend", for obvious reasons. Early-bird burn season (spring 2015)!! 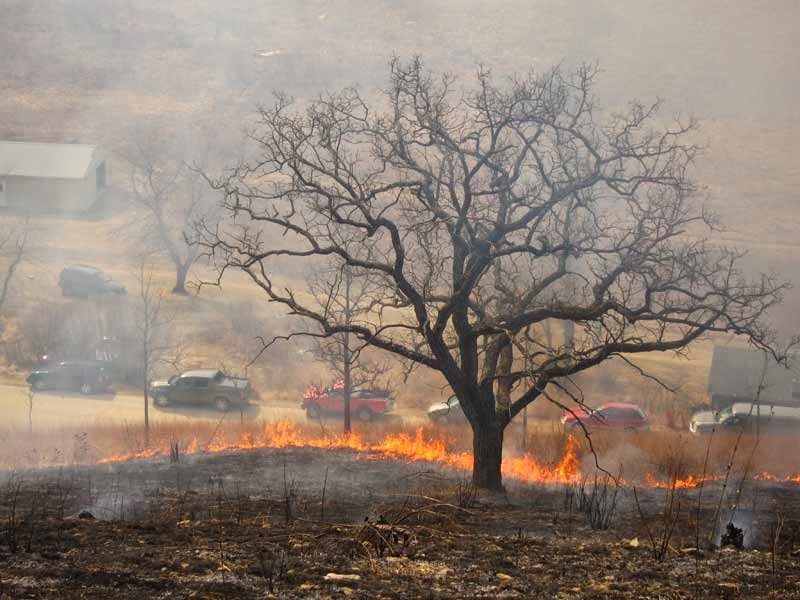 It's hard to believe that the very cold February and early March changed into a perfect season for early spring burns. As the map shows, we almost completed our planned burns over 2 days in mid March. We owe this to the diligence of Amanda, who organized the whole show. (Kathie and I were mostly only spectators this year.) 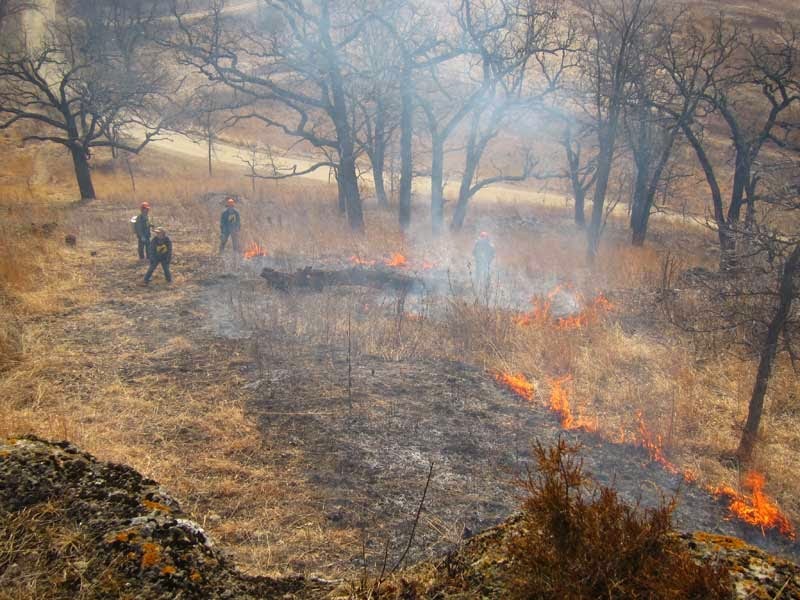 Although we're not quite done with burns, we only have a couple of relatively small burns left (as well as the important burn at Black Earth Rettenmund Prairie). 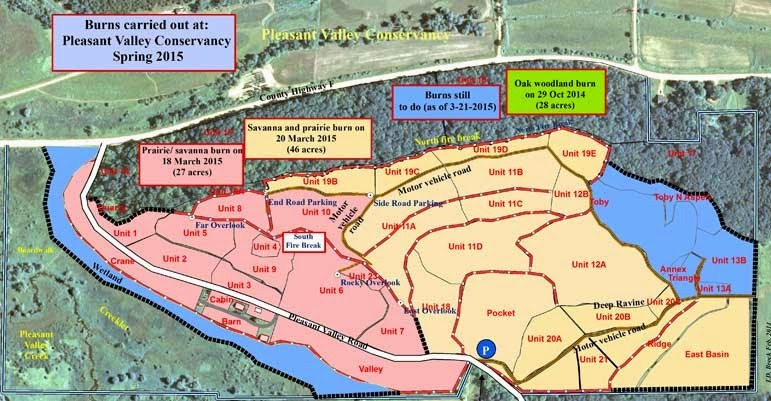 The two major burns shown on the map, 27 and 46 acres, add up to 73 acres. Adding the big woods burn we did on October 29, 2014, we have burned over 100 acres of Pleasant Valley Conservancy during the 2014-1015 dormant season. We made considerable effort this year to avoid damage to the trees, especially the oaks. All of the burns were carried out as backing or flanking fires. This was especially important because this year the fuel was very lush, and hence quite flammable. It takes longer to get backburns burns done, but because our fuel was good, the fire carried well and flame heights were low and relatively benign. little bluestem prairie remnant. At this point the burn is almost complete. The dates when we have been able to do spring burns in our area have varied widely from year to year. The earliest we have burned the South Slope was 13 March, and the latest was early April. Last year we burned on 30 March 2014, and this year it was 17 March. The key to a successful burn season is to plan well ahead and have everything ready when conditions are right. The two major factors are weather and crew availability. This year we hired a professional fire weather meteorologist to keep on top of the weather and tell us when a period of good, dry weather would be availability. This worked very well, although we lost one great burn day because Wisconsin DNR canceled burns statewide, in the areas under their control. This interesting research was carried out at Nature Conservancy natural areas in four States: Loess Hills (Iowa); Glacial Ridge (Minnesota); Nachusa Grasslands (Illinois); and Kankakee Sands (Indiana). In all of these sites, prairie remnants existed embedded within extensive cropland that had been partly planted to prairie. Thus, remnant--restoration pairs existed, permitting a quantitative measure of impact of the planted prairie on the adjacent native prairie. The hypothesis was that resistance to invasion and the richness of the native flora would be greatest next to prairie restorations (planted prairies). Adjacent cropland, and roadsides would be progressively less effective or ineffective in protecting adjacent remnants. The experimental design involved laying transects from the edges of the prairies to the center, and sampling at defined intervals. 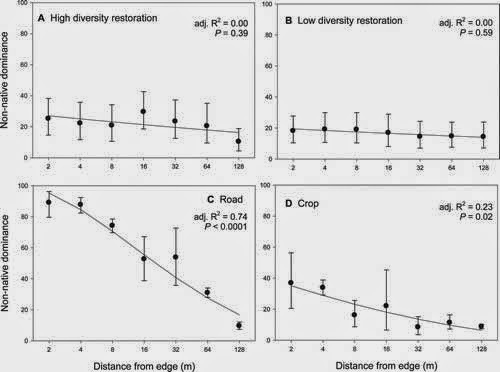 It was found that nonnative dominance was higher at the edges than in the interiors of prairies adjacent to crops and to roadsides, whereas in prairies adjacent to restorations there was no edge effect on nonnative cover (see Figure). remnants for different types of adjacent vegetation. The implications of this study are clear. Prairie remnants standing alone or adjacent to roadsides or crop fields have much greater chance for invasion by nonnative species. Adjacent restorations can protect remnants against invasion. Many prairie remnants are adjacent to ag fields which are suitable for planting to prairie. Since planting prairies is a relatively inexpensive activity, these data provide strong encouragement to carry out such plantings. A further point: when prairie remnants are being acquired as part of land acquisition programs, high priority should be given to sites with extensive adjacent cropland or old fields suitable for prairie planting. Here is the citation of this paper: Rowe, Helen; Fargione, Joseph; Holland, Jeffrey D. 2013. Prairie Restorations can Protect Remnant Tallgrass Prairie Plant Communities. American Midland Naturalist Vol. 170 (1): 26-38. A prairie remnant (Black Earth Rettenmund Prairie) surrounded by ag fields and roads. An undesirable long-term situation?